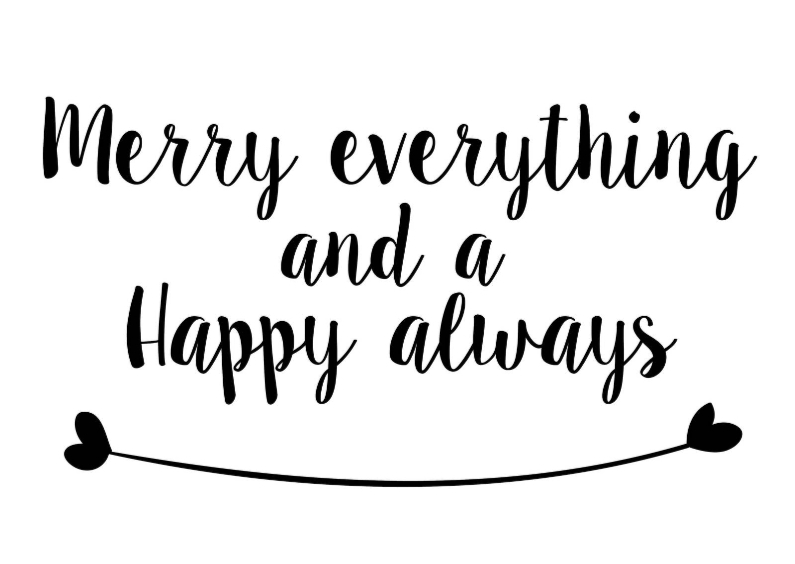 Happy Reading, friends! We're busy Cybils-ing, so see y'all on January 9th! Synopsis: This was one of my "waiting on" titles of 2017—the His Dark Materials trilogy is one of my favorites (and one I wish I'd read as an actual young adult), and I've enjoyed other books by Pullman as well. 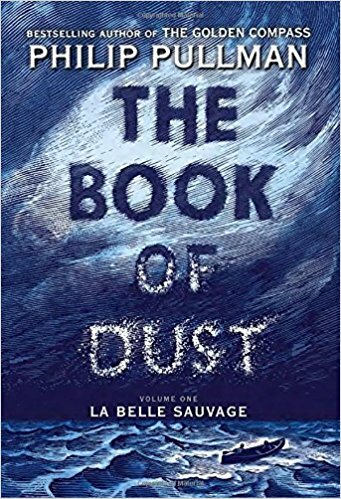 The Book of Dust: La Belle Sauvage is the first in another trilogy, it seems, and it's a prequel to the adventures of Lyra in His Dark Materials. To my mind, it was worth the wait. Observations: I don't want to give away too much of the story, because it's too delightful to watch it unfold (plus you can always read the cover blurb). I will say that I was happy to return to this alternate world very like our own, and root for a hero with curiosity, tenacity, and an innate sense of right. Malcolm is truly good, and his love for the baby Lyra and determination to keep her safe drive the story and keep the reader hanging on every word. Of course, any story that involves good vs. evil would be incomplete without a truly bad baddie, and Pullman has a talent for pushing just the right buttons to make the reader really uncomfortable—the enemy here takes the form of a truly frightening individual, and the philosophical underpinnings of WHY he is evil are possibly even more frightening. I received my copy of this book courtesy of my library's ebook collection. You can find THE BOOK OF DUST: LA BELLE SAUVAGE by Philip Pullman at an online e-tailer, or at a real life, independent bookstore near you! The Cybils SpecFic Bookmark: As a panelist for Cybils YA Speculative Fiction, Round 1, I'm going to be briefly writing up some of the hundreds of book I read as part of the award. As panelist conclusions are not for public consumption, the purpose of these write-ups is to keep track of what I'm reading, and will mostly touch on plot synopsis, with minimal comments on thematic tropes. Synopsis: One melancholy feeling day, Hadley Jamison arrives at school to hear that a boy she'd been in Freshman English with has committed suicide. The feeling of melancholy she feels quickly swells to true grief. She hadn't spoken with Asher Morales in years. Really, she only stared at him in Freshman English and blushed a lot... but it seems wrong that he's dead, wrong that someone who had such obvious depths - even if he never spoke to her to share them with her - could have thought his life wasn't worth living. Seeking closure, Hadley lurks at the back of the church where his funeral service is being held. She lingers at his casket, wondering what she could have said to change things. She meets his family, and, on the way home, is accosted by the most terrifying man she's ever seen. Parchment white skin, knife-edged cheekbones, and the most insinuating smile. He takes her to coffee, and she's powerless to escape him. He has a proposition for her - a little job he'd like her to do. If she'll just sign a contract to help out, he'll drop her back twenty-seven days in time. She'll have a chance to save Archer, and right a little wrong in the Universe. The guy says some vague things about danger and trouble, but Hadley's only hearing that there's a chance to bring Asher back to his family. Her parents are on yet another business trip, and the last person she talks to every night is the doorman. What else does she have to do with the next month, anyway? But Asher is not easy. He's rude. He's abrupt. He's closed off and cold. Hadley's doing everything she can to get close to him, but if someone doesn't want you as a friend, you won't be friends. Is it worth it to keep trying? Is it worth caring for someone who doesn't care for you, especially if it looks like it might cost you your life? Semi-Spoiler-y Observations: Originally published on WattPad, this is a fast-paced, emotionally engaging adventure which leaves the reader little time to do anything but hang onto their hat and be dragged into the narrative. A dominant culture girl with a cast of mostly white friends (Asher is Italian) Hadley is a very regular, ordinary girl who is suddenly thrust into a cosmic tug of war essentially between death and chaos. While she is chosen to take a stand against chaos, I found myself with a tiny question of "Why?" I kind of wished for a little bit of ...mystery or backstory to give her character some depth. Her parents are workaholics with money and impeccable tastes, but how did the Universe know that Hadley was worthy of taking on this huge task? Does this second chance business happen for anyone else? Most people won't worry with nagging questions like this one, however, and will race into the story. As an adventure, giving a human being the power to fight on the side of life, it is compulsively readable. Conclusion: For anyone who has wished that they could have a second chance to make things right, this story will be the best of wish-fulfillment catnip. A slow burn romance, a boisterous Italian family, and a chance to tally one up for the side of good vs. evil makes this a light, fun, vacation read. I received my copy of this book courtesy of the publisher. 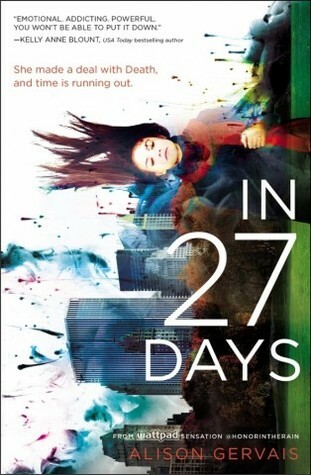 You can find IN 27 DAYS by Allison Gervais at an online e-tailer, or at a real life, independent bookstore near you! The Cybils SpecFic Bookmark: As a panelist for Cybils YA Speculative Fiction, Round 1, I'm going to be briefly writing up some of the hundreds of book I read as part of the award. As panelist conclusions are not for public consumption, the purpose of these write-ups is to keep track of what I'm reading, and will mostly touch on plot synopsis, with minimal spoiler-y comments and thematic tropes. Synopsis: Rosa is young, British, and has had a debilitating nerve disease which has taken her freedom. Quadriplegic and feeling like a burden on her family, she is eager and excited when a controversial "cure" emerges - the chance to swap her brain into the whole and healthy body of a comatose American girl named Sylvia who was also white and young. The family flies to America, and the surgery is done... but Rosa's doubts begin. Is she still... herself? Is she now someone else, too? Is she also carrying Sylvia's soul? Is it fair to go on if Sylvia - whom Rosa is now convinced is a resident somehow in her body - is unhappy? An unhealthy obsession with Sylvia begins, as Rosa researches her, stalks her family, and eventually attempts to insert herself into the life of the girl who is gone. With the help of a journalist with whom she becomes entangled, Rosa escapes from the medical facility where she's meant to be healing, and walks away from her own life to immerse herself in Sylvia's - hurting her own family, and ultimately herself. As she struggles to come to grips with who she is now, and who she's supposed to be, now that she's inhabiting Sylvia's body, Rosa falls in love and finds that the questions she had matter less than living her very best life, and being happy. Observations: Speculative fiction has been debating the merits and demerits of brain swaps since the first very amusing black and white science fiction films. It's one of the last Big Questions about consciousness and the soul and the "you-ness" of a person. Rosa feels a lot of guilt after the surgery - guilty for being excited that she's attractive, guilty that she is attractive to others, guilty that she is just who she is, and not someone better or more deserving. She is conflicted and spends a lot of time in her head, coming to various conclusions about whether or not Sylvia is a reluctant rider in their shared body, or if Sylvia should take over and Rose should step back. She had a lot of questions, and I was dissatisfied with the conclusions Rosa came to, because she was derailed by her romance. Rosa watches a movie with a friend about a man who chooses to die rather than live with a disability... and especially since Rosa has lived with a disability, one that had really hit her from the ages of ten to eighteen, that seemed an odd choice, and I expected her to react differently to the film. The author doesn't give us much information about Rosa's disease or the nature of its progression, or enough backstory to help us understand what what her life was really like, before having her brain swapped. Rosa's disability is framed against her parent's anxieties and her concern with not being a burden to them, but that tells us nothing about how she lived and what she did - which argues that the life of a quadriplegic person is of so little interest that the reader wouldn't have wanted to know anything about it. Which isn't true. This was one of the biggest quibbles I had with the novel. Conclusion: An interesting and time-honored concept in speculative fiction, the brain swap remains one of the last bits of "undiscovered country" in our physiology. Rosa deals with questions and worries to that many a teen will relate. The idea of turning into a whole new person with a whole new brain, and finding a whole new attractiveness and a lightning fast romance will also resonate with many in an entertaining way - but readers seeking something with a deeper and more realistic look at disability might look to Sharon Draper's OUT OF MY MIND or Chelsie Hill's PUSH GIRL for more. I received my copy of this book courtesy of the publisher. 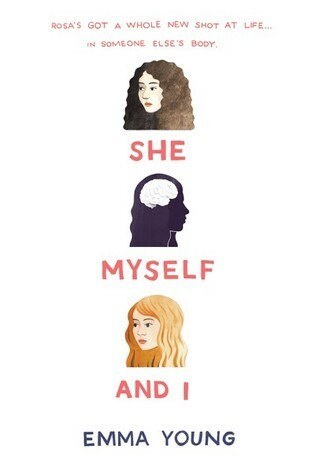 You can find SHE MYSELF AND I by Emma Young at an online e-tailer, or at a real life, independent bookstore near you! Happy December! The Cybils Countdown Continues! Synopsis: Adam just wishes he could sleep. That's what normal people do: see their fathers. Sleep. Go to school. Talk to people they might kind of crush on. Normal would be great, but it's just not in the cards. First, Adam's mother vanished when he was four, and his dad is always gone, and never around when he needs him... except Adam sometimes sees him in his dreams. Adam instead lives with his cranky, paranoid grandfather, who believes everyone is out to get him. Adam's next challenge is that he can see... shadows on people. He knows when they're going to die, and no matter what he does to try and tell them... they die anyway, even if he's changed their path. Finally, speaking of dreams, there's this kind of... monster who basically hugs him to death when he dreams, and then he wakes when his dream-Dad saves him. Lacking sleep and overdosed on coffee, Adam fights monsters in a waking dream at school one day. Unfortunately, he wakes up with everyone believing he's had a nasty psychotic break. In the name of getting him "help," his father enrolls him in a residential school... which isn't for kids with psychiatric problems at all. It's for kids with the power to be soul guides. Adam finds opening to him a world he could never have imagined in his deepest, scariest dreams. He finds a place to belong, which surprises him, and feeds his soul. He also finds out about his mother - who disappeared in mysterious circumstances - and the whys and wherefores of his parents' relationship. He also finds himself going up against a shadowy organization which is bent on destroying him, and maybe his school, too. Adam's going to need to accept a few key things before he can move his story further - and unravel the unknowns between him and his goal of being normal... well, as normal as a guy who can drop into Limbo can be. Observations: In many ways this story is familiar - there have been myriad other Secret Identity novels in which the Lost Prince or Boy Who Lived is unaware of a birthright world just on the other side of a bland retaining wall. He twists in the wind in a world where he doesn't belong until, voila, the hidden door opens, the wall vanishes, and the world, with its thousand shades of gray, opens. Nothing is pure good or pure bad anymore, the character stumbles and drifts until he meets a band of plucky outliers, and together they navigate this new plane. There are PLENTY of Potter elements in this book, but it is not about the new-things-per-page lovely whimsy which drive the earliest Potter novels. This book is dark and grim and Adam's existence is both snarkily amusing and realistically painful. 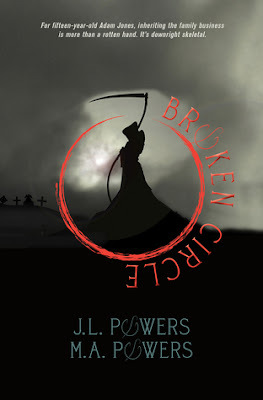 While there have been other YA novels riffing on the idea of the Grim Reaper, and while the cover with the elegant scythe on it is a dead giveaway of some of the narrative elements, there is a lot of difference here to be discovered. Readers will rejoice in the brother-and-sister team's worldbuilding, which is rich and detailed, and while the twists in this book are mostly known before the character knows them, the characterization and remix of mythology will keep readers reading. Adam's self-effacing, sarcastic voice will work well for many readers. Conclusion: Come for the sarcasm and the familiarity, stay for the unknown and the yet undiscovered! While this book wrapped up nicely in an "episode" fashion, there are some unanswered questions which leave room for a sequel - stay tuned. I received my copy of this book courtesy of the publisher. You can find BROKEN CIRCLE by J.L & M.A. POWERS at an online e-tailer, or at a real life, independent bookstore near you! 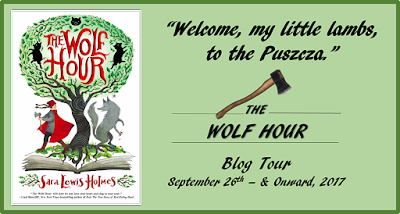 If you haven't yet had a chance to grab Sara Lewis Holmes' newest book The Wolf Hour the following posts and her various guest post/interviews around the web will raise this book on your TBR list. Sara's talking music with picture book writer Liz Garton Scanlon. Calling it a "musical novel by a lyrical poet," Liz's interview arrives just in time for Poetry Friday. 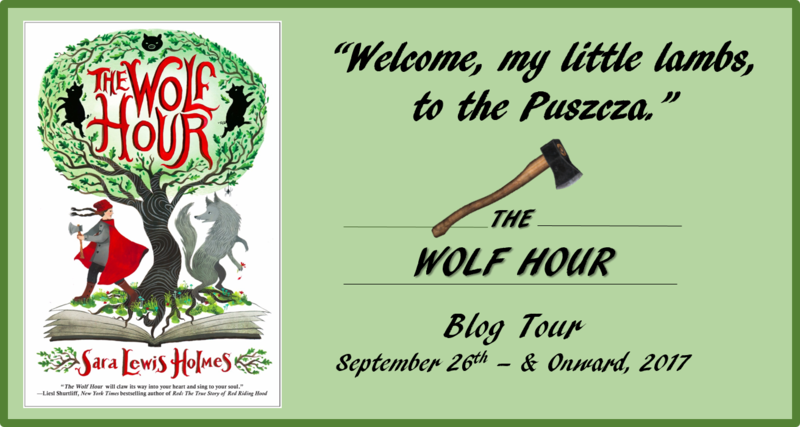 Liz asks Sara questions which are both deep and broad, and, frankly, Sara says, have her learning more about her book post-publication than she knew going in! That sort of interest and scrutiny is what we can all only hope for in our book interviews! Sara's earlier interviews on THE WOLF HOUR can be found at Laura Purdie Salas' site, where she also talks of the music in poetry; at Charlotte's Library where she unpacks some of the deeply intriguing quotes from the book; Maureen Eicher's review at 'By Singing Light' and our interview here at Wonderland, which kicked off this slowly perambulating blog tourback in September. Synopsis: After the Melt, nothing is the same as it was, though Frenchie has heard stories. Epidemic disease, flooding, earthquakes and other disasters rage and the natural world is wildly out of balance. And then, the madness takes hold, as people lose the capacity to dream. In tribal communities, whispers of "Recruiters" surface. It seems that, together with the Church, the world has discovered a cure for the hopelessness and madness, and a way to save themselves. As always, this salvation comes through the blood of sacrifice - but only the sacrifice of some. The indigenous people in North America have not been touched by the chaos in the larger world. Their communities remain ...sane, and in the marrow of the indigenous peoples has been discovered to be a cure. "Recruited" into "helping" to save the world, indigenous people are being forced into residential housing and robbed of their bone marrow. It saves those unable to dream - and decimates the tribal populations. With his father gone, his mother abandoning him and his brother lost to him, Frenchie at sixteen is shattered, heartsick, desperate and ill. Feverish and self-destructing, he stumbles on two other Elders and a passel of little kids also seeking their loved ones and trying to make some sort of a family and a home on the run. Wary and hopeful, he falls in with their pack, and begins to lose his heart to this band of survivors - and to make room in his heart for real love. Survival, however, can wear a person to the bone, and then disaster, which is always so close, strikes. In their quest to regain what they've lost, Frenchie and his team find what they weren't expecting -- in loss, promise, in conviction, re-connection. Through disaster and rebuilding, they learn that the things we love we truly never let go. Observations: Every time I hear people telling me that post-apocalyptic fiction or dystopia is dead, I find a book in which there is a new and clever way of fleshing out what could be a stale and weary literary device. The author doesn't just plug North American indigenous tribes into a trite formula, however, but deeply weaves truth and metaphor into a conflicting and revealing story. That the world ends badly and everything goes to hell is, of course, the basis of a post-apocalyptic novel, but too often speculative fiction then retreats into a story of mostly white females escaping from zombies or something. I especially appreciated this book because a.) there is a family here, with the sacred love between siblings that allows them to sacrifice for each other, b.) the story has nonwhite allies who have put their sweat and blood into saving people, and thus does not further the white savior narrative, c.) there is love of all kinds, and in fact that love story rises above the darkness and desperation of familiar losses and desperation. The disaster-and-survival aspect of the post-apocalyptic narrative is another place where the book is different... despite the impacts of global warming, earthquakes, and floods, the survivors don't seem unable to face the task. Not that living rough as an 'Apocalyptic Boy Scout' is anything but wearying and at times, dangerous; not that people don't sometimes greet a bed in an abandoned hotel with the greatest of joy. It's that these characters have their Elders and stories of the past on which to draw courage and techniques to survive. They each take up their burden - with only minimal outbursts of the unfairness of it all - and they get on with their true task, which is to rescue their lost ones, and recover their families again. Bone marrow is the spongy tissue inside our bones, which, in newborn babies, produces new marrow cells, or stem cells. By young adulthood, the marrow inside the bones of the hands, feet, arms, and legs stop producing new marrow cells, and active marrow remains only in the spine, hip and shoulder bones, ribs, breastbone, and skull. All bone marrow produces blood cells, called red blood cells, platelets, and white blood cells - the things which are key to life, growth, and our survival, by which we fight off disease. When the "Recruiters" come to steal the marrow from the indigenous people in the book, this echoes the metaphor of what was done in American and Canadian history to indigenous children in the Westernizing residential schools. In taking their freedom and their language, their cultural health was being stolen in return for emptiness and death. 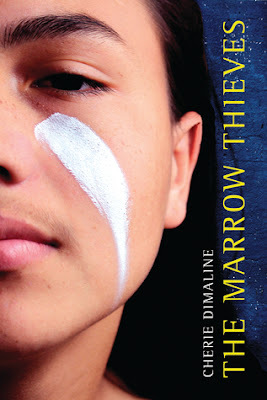 Conclusion: There is an exquisitely painful irony in the idea that marrow is what cures society of its inability to dream, and that they are taking the marrow from the indigenous peoples in the story. Despite the metaphor and shifting layers of depth and meaning, this is still an active story with a heart - at turns grim and painful, brutal and inevitable, and in other moments, tender and careful, hopeful and beautiful. It is not a fast-paced adventure, and this is not a book you will be able to skim through and put away. It draws readers in and they may find they care deeply about the wisdom and sacrifice of Minerva; about Miig and the memories he holds around his neck, a pouch full of glass shards and lost hope; about Rose and her round cheeks and flinty will; about Frenchie, and his longing for something - safety, maybe, freedom, and hope. This book will likely resonate with readers who enjoyed Walter Dean Myers' post-apocalyptic novel ON A CLEAR DAY, Patrick Ness' THE KNIFE OF NEVER LETTING GO, Moira Young's BLOOD RED ROAD, or Ann Aguire's ENCLAVE series. I received my copy of this book courtesy of the publisher. 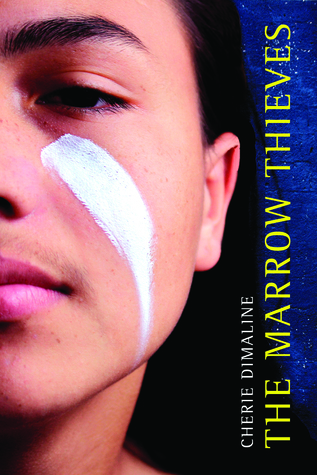 You can find THE MARROW THIEVES by Cherie Dimaline at an online e-tailer, or at a real life, independent bookstore near you! Synopsis: The Oresteia are the river - they've never been anything or done anything but skim up and back, hauling and freight throughout Riverlands as is their fate, through the auspices of their god. A fair bit of smuggling happens up and down the river, too, but the god stays mum, the wherries are sturdy, and there's always extra space for whatever, right? It's a free and easy life, freight-hauling, smuggling, and knowing the other wherrying families moving through the waterways. Caro was sure this was her fate, too, but the god never speaks to her - she's of age and past it, but even though she trolls her fingers into the water and listens hard, she never...quite...hears. It is the private heartbreak of her life, to be calling and calling, and never answered. And then, on a day when too many other of the wherry families have lost their barges due to a terrifying act of piracy, Caro's father is arrested. Smuggling's the charge, but it's mainly for refusing to ferry goods for soldiers. What's IN that ridiculous crate, anyway? To spare his life and commute his sentence, Caro agrees to carry the box without her Da -- only to realize she's being pursued, first by a mysterious fast cutter, and then, by every two-bit pirate and murderous dog in Riverlands. The smooth-talking courier who claims to know everything is obviously not telling her the truth. If only Caro knew which way she was supposed to go! Politics, treachery, and lies are also in the churning waves - as well as gods and monsters. As Caro immerses herself in the current, a steadying hand on the tiller, she has to navigate these waters safely, or more than just her life and her father's life will come to an end. Observations: Readers who enjoy fast-paced adventures with a whiff of politics will like this one. There's no overwhelming feeling of danger, as the plot twists aren't hidden, but easily discerned. This reads more as a safe adventure, in which the reader can be carried along without anxiety, knowing that, even though there are a few unexpected splashes along the way, the river runs true. The idea of gods and them speaking is not often encountered YA lit, and this book contains an interesting exploration of this. Many readers will find the idea of life-guaidance via water entity an intriguing one. Readers who enjoy books which tell a simple story, and reveal a simple truth may find themselves drawn to the characters in this novel. Mistaken - or hidden - identity is often a fun trope, and though the way in which it is used in this novel is as familiar as a song, and readers will likely see it coming, it is nonetheless still fun. Who we are, and where we belong is something which can be determined ONLY BY US, and many teen novels, with their emphasis on the herd's decisions or parental input, can miss this. As teens, we spend a lot of time hoping this is true, and not sure we believe it, but this novel verifies: there is a place for us, and only we can find it, defying what our mothers are, or what our fathers say, there is a way forward for just US... if we have the courage to take the wheel and sail that cutter into the sunset. Conclusion:Readers who enjoyed girls-on-the-sea books like HEIDI HEILIG's THE GIRL FROM EVERYWHERE duology, or Emily Skrutske's ABYSS duo will enjoy this story of a lively sailor girl who wants to be the terror of the high seas... eventually. Once she figures out to whom she belongs, and where. There's a bit of sailing jargon, which might produce a learning curve, and there's tons of travel, but the book is supplied with a map, so the intrepid reader shouldn't lose their way. I received my copy of this book courtesy of the public library. 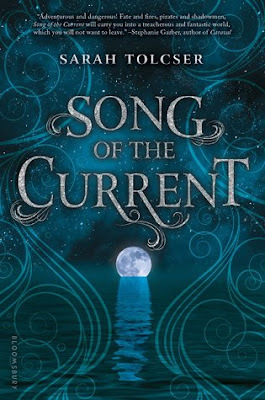 You can find SONG OF THE CURRENT by Sarah Tolscer at an online e-tailer, or at a real life, independent bookstore near you!